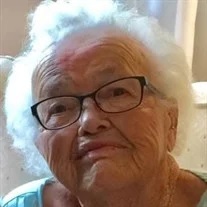 Lorenia Clark Browning, 96, of Rossville, went home to be with The Lord on Tuesday, January 15, 2019. She was born in Walker County to the late James Polk and Minnie L. Trotter Clark. She had resided most of her life in Walker County in the Rossville and Lookout Mountain communities. She was a former employee of Trenton Spinning Mills and was a homemaker. She enjoyed quilting, working crossword and jigsaw puzzles. She was a member of Mission Ridge Baptist Church in Rossville. Along with her parents, she is preceded in death by her husband, Maitland Browning and ten siblings, Johnny Clark, Maude Higdon, Louise Chambers, Lodenia Massey, Claude Clark, Baxter Clark, Herbert Clark, Duke Clark, Bonnie Lee Higdon and Roy Clark. She is survived by her children, Patricia Maureen (Donald) Lanza, Barbara Ann Browning, all of Knoxville, Jimmy (Kathy) Browning, of St. Petersburg, Fl. ; grandchildren, Kellie Henry, Kimberly Zirkle, Allen Easter, Meaghan Browning, Caroline Homme, Jon Morgan Browning, Chris Lanza and Julie Lanza; four great-grandchildren; and several nieces and nephews. Graveside services will be held at 2:30 p.m. on Thursday, Jan. 17 at Chattanooga National Cemetery, with Brother Jim Lilley officiating. In lieu of flowers, the family requests memorial donations be made to St. Jude Children Research Hospital at 262 Danny Thomas Place, Memphis, TN 38105.